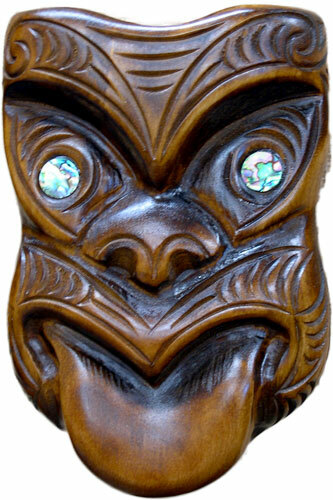 Maori Masks New Zealand Souvenirs Gifts. 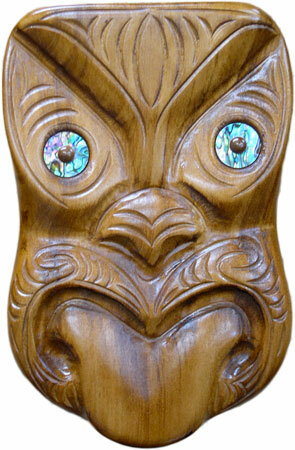 Waka/Moko: These Masks adorned houses, gateposts, and important buildings. Portrayed important chiefs and noteable people in tribal legend and history. Koruru: (Owl) This Mask Represents an ancestor (usually a chief) It is a carved head on the gable board of a meeting house (whare). 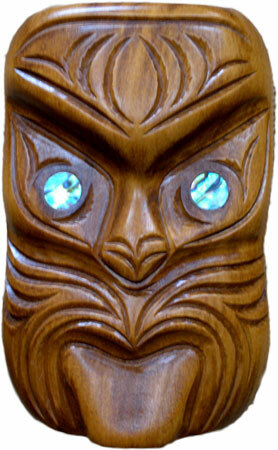 This mask has large owl like eyes that keep guard over the Marae. The protruding tounge that many of these masks have signifies defiance toward an enemy. Weku: The Weku Mask represents an ancestor of chiefly line and was used almost exclusively for the Pou-Pou which were used to decorate the interior walls of the meeting house. Pou Pou - were carved slabs that represented descendents of a chief and were used to line the interior walls of the meeting house. All of these carvings are made from wood. More information on the Maori carvings and meanings. Great New Zealand Souvenirs & Gifts.